It’s not going to be raging hot. In fact, it might not be raging hot for the whole rest of July. But it will at least be pleasant. I think this summer may go down as one of the coolest we’ve had in many many years. But we’ll see. This is in stark contrast to the rest of the world, which continues to set global temperature records. Droughts in Texas and North East Africa are the worst in years. 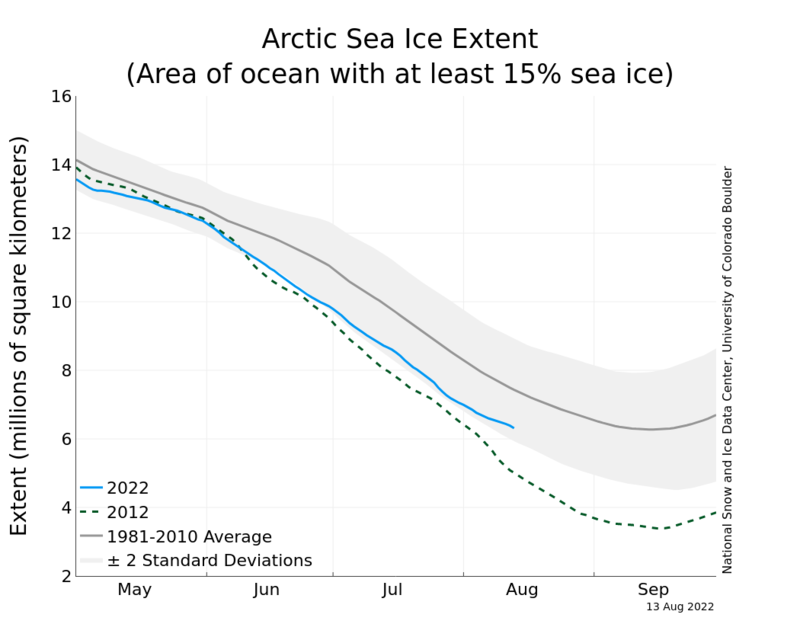 And the Arctic… well, it’s not on a good pace right now. It sure would be nice if that little blue line was closer to the big thick (average) line then the green dashed (record low) line. This will likely have a major impact on North American fall and winter weather, as it has the past few years. Previous Our first real shot at Summer! a cool july? That is AWESOME!!! We should be moving into the hottest days of the summer, but instead we’re looking at highs of 17C to 19C for the rest of the week! I have to say Chris, the long range forecast on Accuweather is looking pretty grim too!